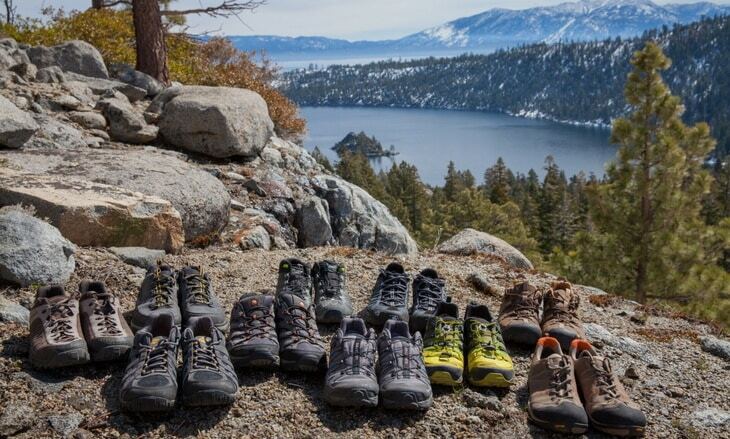 Best Hiking Shoe Brands: Which Brand Works Best For You? If you love to hike, you know that a great pair of hiking shoes is exactly what you need to make the most of your experience. You must make sure your feet are comfortable because hiking can take a toll on your body after a while. Some brands are definitely better than others, so we will discuss the best hiking shoe brands so you have options when you begin looking for your next great pair of hiking shoes. Hiking shoes are either high top or low cut and have mid soles that can flex a little. You can find them in various weights. Everyone wants their hiking shoes to have style, but they must also be functional. You will want to make sure the soles are comfortable for your feet, and that they have enough tread. Do you want ultra light shoes? 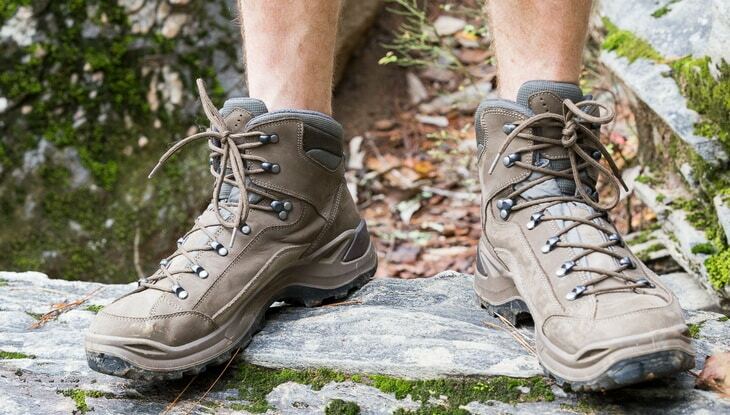 Are you looking for hiking boots just for day hikes? These are things you will have to ask yourself when it comes to ensuring that you get what you need out of hiking shoes. Continue on below to learn more about the features you should keep and eye out for, and a review of the top hiking shoe brands to help you choose your next pair of functional, comfortable hiking shoes. See below for the important features to keep in mind when searching for a pair of hiking shoes. 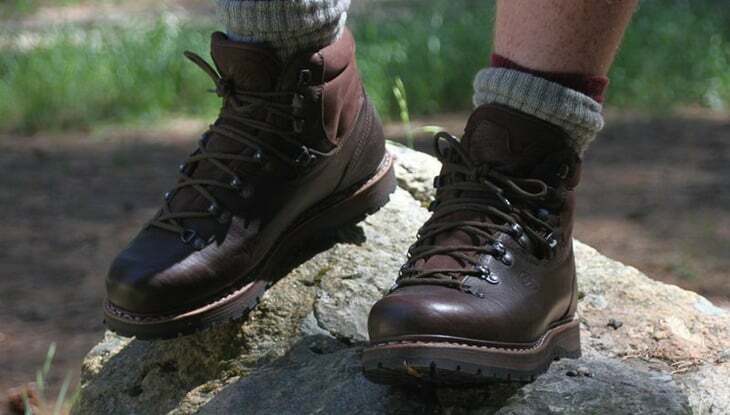 There are a few types of hiking boots, and you should consider what type of hiking you are going to do before you purchase any shoes for outdoor activity. 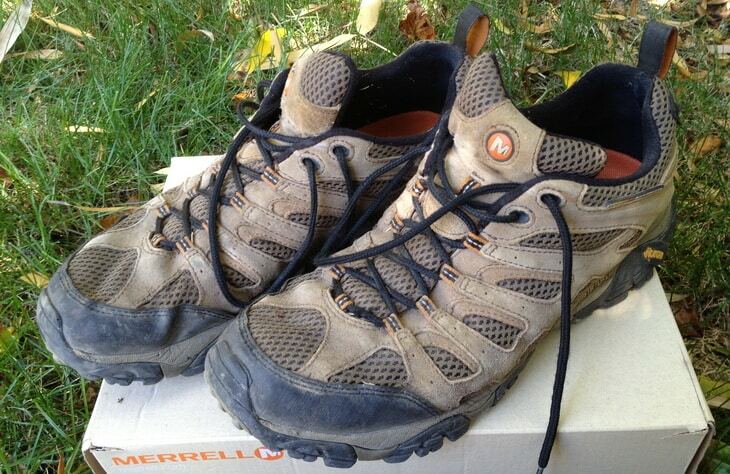 Regular hiking shoes are generally high cut and offer support and comfortable soles for long bouts of hiking. 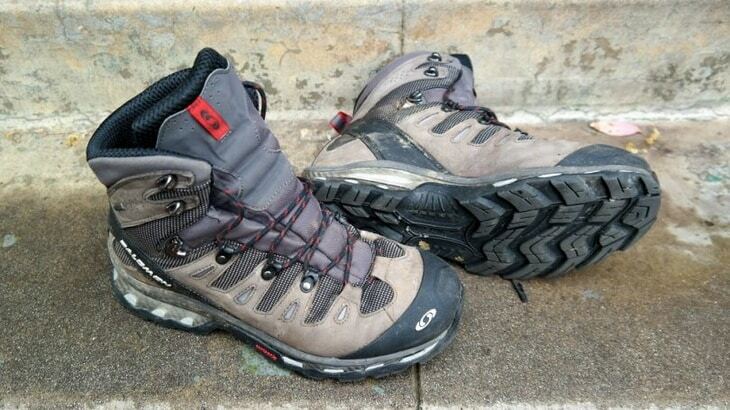 Even backpackers use regular hiking shoes for their longer backpacking trips. Usually, they are made to have some ability to breathe. Day Hiking shoes are mid to high top length and are meant for hiking for the day, or for short term backpacking adventures. These flex better than regular hiking shoes, and they do not take long to break in and get comfortable. They are only good for a day because they do not contain a lot of inner support, and are not as durable as regular hiking shoes. 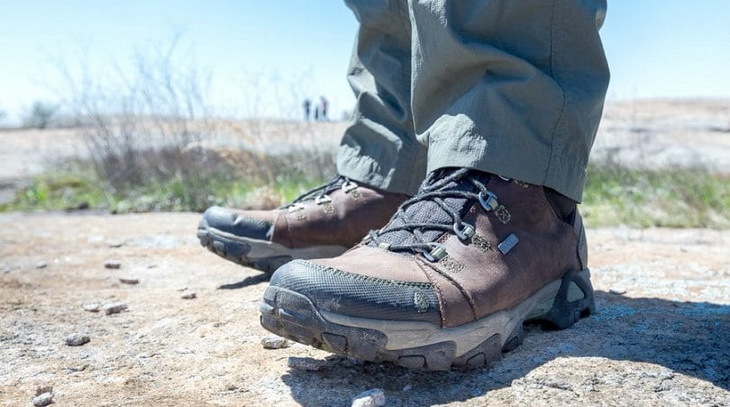 Backpacking shoes can be worn by hikers that are carrying more weight, or are hiking for a few days at a time. These shoes are high cut and have more ankle support. 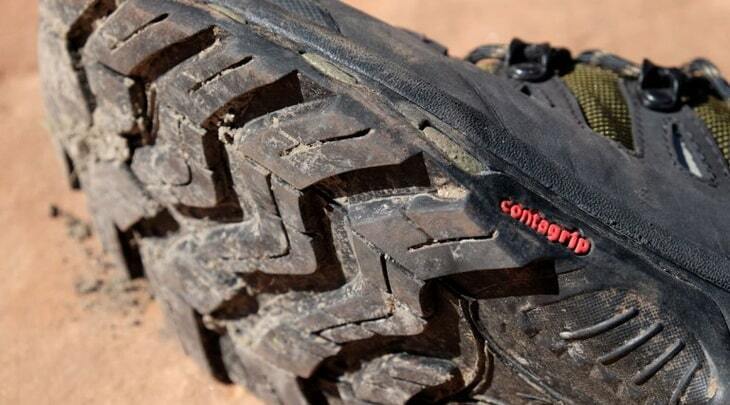 Not only that, they do offer more durability and support overall, and can be worn off the beaten path. 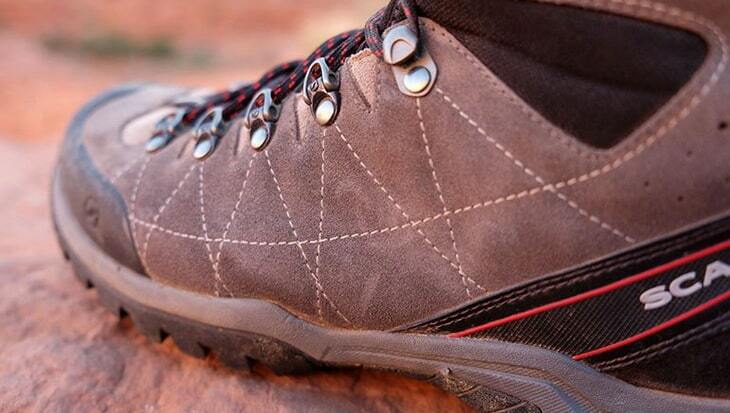 Several components exist that make hiking shoes durable and supportive. Here are some of the top components that should be taken into account. 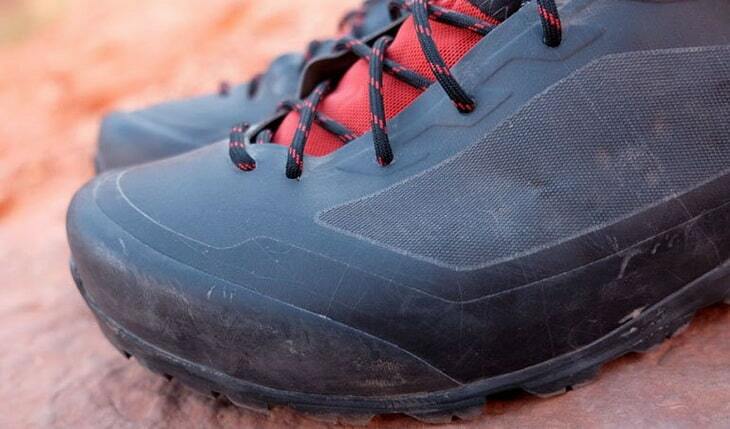 The materials that are used have a full effect on the durability, weight, and other factors of the hiking shoe. Full Grain Leather: This is the best type of leather to get because it is the most durable and resistant to water and scratches. 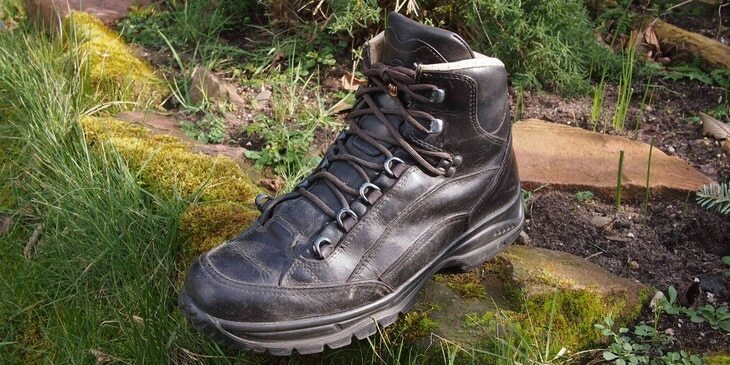 While it is heavier than other leathers, and it does not breathe as well, these are great for an extended hiking trek. Keep in mind that you must break in these shoes before you actually go hiking. Split Grain Leather: This type of leather is lighter in weight and is made with either all nylon or a nylon meshing, which keeps it light and helps with the shoe being able to breathe. It is lower in cost, but it is not as water or scratch resistant. Nubuck Leather: This is a full grain leather, but, it is buffed in order to give it a look of suede material. The great thing about this is that it is like the full grain leather listed above. It is resistant to water and scratches. It is flexible and highly durable. It is made of synthetic materials, such as polyester and nylon. While they are light and dry fast, they can wear quickly and needs a little time to get broken in. Nubuck leather does cost less and dries faster, too. 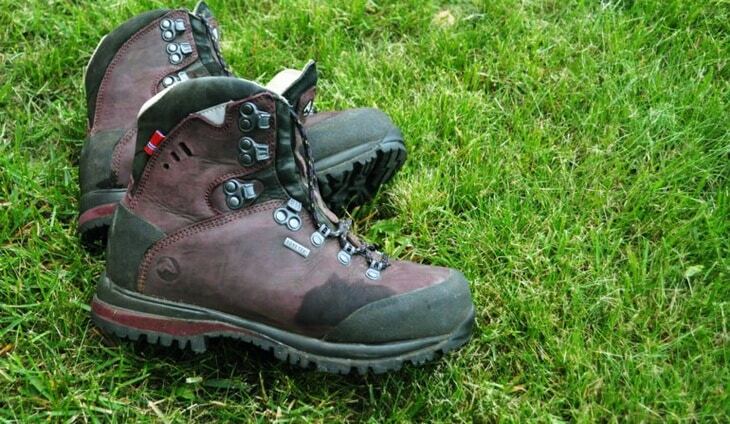 Find out how you can waterproof your leather hiking boots by reading our article on this all-important subject. The mid sole is the cushion and shock absorption part of the shoe. You will want a stiff feeling that will not wear your feet out. For the most part, the mid soles are made with either polyurethane or ethylene vinyl acetate (or EVA) with polyurethane. EVA is lighter, cheaper and offers more cushion. Polyurethane itself is more firm and strong, and is best used in hiking shoes that are good for long periods of hiking. The outsoles are made of rubber and can contain carbon. Having tough outsoles keeps your shoes strong, but are not that good off the trail. Lug patterns on the outsoles give you traction, especially if they are side wide apart. Plus, they get rid of the mud. Heel brakes are the areas from the arch of your foot and the front of your foot, which keeps you from sliding, especially in steep areas. See our piece on DIY boot sole repair that can just help you in an emergency situation, check out this article. If you are hiking during the winter, you should consider using crampons. You can find many hiking shoes that can use crampons as a part of hiking. These keep you gripped and stable while you are out in the snow. 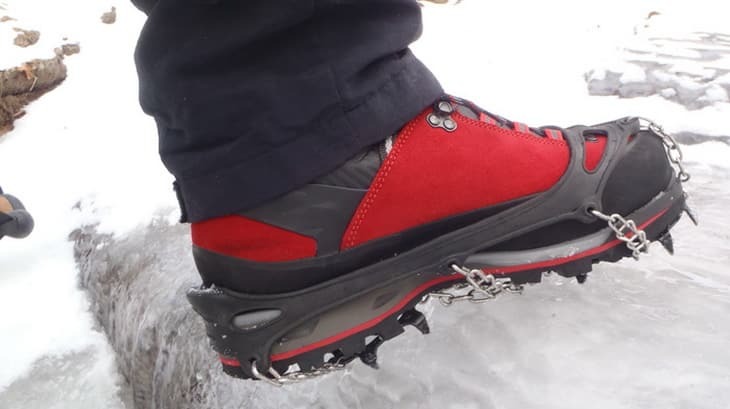 If you’re having thoughts in using crampons, our informative article on the basic differences between crampons and microspikes will give you more options. You want to make sure your hiking shoes fit and are comfortable for a long day, or several days of hiking. Thus, there are a few things to keep in mind to keep your fitting perfect on a long hike. Knowing which size you wear is the most important. You can have your feet measured not just for length, but for arch, width, foot volume, etc. If you normally wear Orthotics, you will need to wear them while hiking, so bring them with you for sizing purposes. Wear socks that you normally wear to try on hiking shoes, as this will give you the best feel of the shoes. Walk around in the shoes when you are trying them on. If the store has stairs, try the shoes out on them or any incline to get an idea how the shoes feel. If you are going to make a purchase online, you are better off going with a brand that you are more familiar with. One last important thing is to break in your shoes before going on a hike. Otherwise, you could end up with sore feet, blisters, and cramped toes. Give the shoes time to adjust to you. Here are some other things you can take into consideration when shopping for a new pair of hiking shoes, in store or online. 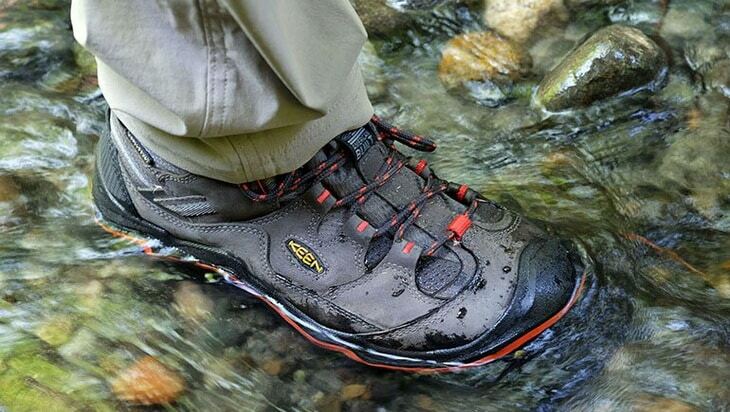 Waterproof shoes are made with membranes like Gore Tex that will keep you dry in wet weather. However, this makes the shoes less able to breathe and can make your feet sweat. Vegan friendly hiking apparel is available if you look hard enough. This means it is made without any animal ingredients, such as real leather. Insulated hiking shoes can be found if you are looking to tread through a little snow during the winter months. This keeps your feet warm and allows you to hike through some beautiful winter scenery. Now, we can review some of the top brands that make hiking shoes, so you can get an idea of what you like when it comes to brands. This brand has been around for a while and is widely popular. Their hiking footwear is known to stay dry in wet weather and are incredibly stylish. Some of them are made of EVA foam and they do not hold onto smells or moisture! 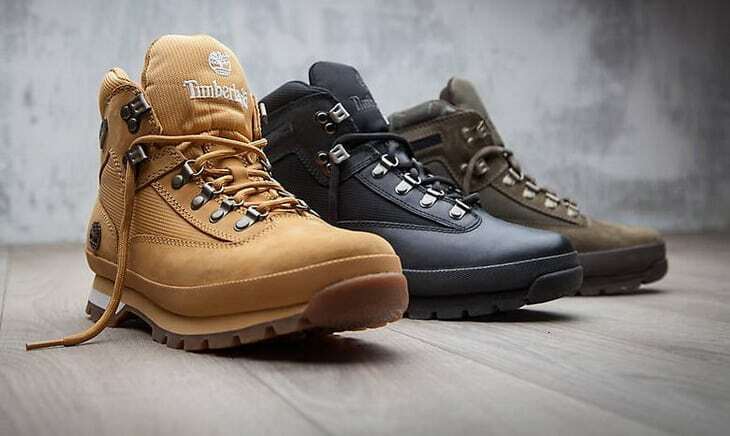 For example, the Timberland White Ledge Waterproof shoe is made of full grain leather that is waterproof, and it is resistant to scratches, plus it is highly comfortable! Reasonably priced, you will not be disappointed in this shoe, or this brand! Columbia is known for their outdoor gear, and they know what they are doing! That is why this brand is easy to trust, plus they are so innovative! Not only that, but their gear is reasonably priced and made from high quality materials. Their Women’s Newton Ridge Plus Hiking shoe is waterproof, made of full grain leather, and is even resistant to stains! Highly durable, this shoe is great for harsh terrain! Their, Men’s products, are just as reliable. Do not be worried that you will spend too much. Ahnu is not a super well known brand like Columbia, but they do offer reasonably priced gear that will grab your attention. Their, Women’s Sugar Pine Hiking shoe, is sturdy for harsh terrain and is still light in weight, and waterproof. It includes a secure lace up vamp that keeps your shoes tight to your feet. Ahnu makes colorful gear that will pop out and make you look stylish! They also have self cleaning lugs and keep your feet, guarded against rocks and other sharp objects in the wild. Merrell makes their hiking gear with such great quality materials, that it is easy to see why they stand out among others. They make shoes that are for any type of hiking and other outdoor sports. They add in a sole with rubber that helps with grip and strength. Their hiking shoes have no issue breathing, and many of their products have an odor control, so you never have to worry about a smell. Some of their shoes are a little higher in price that some, but for the quality, you really can not beat it! 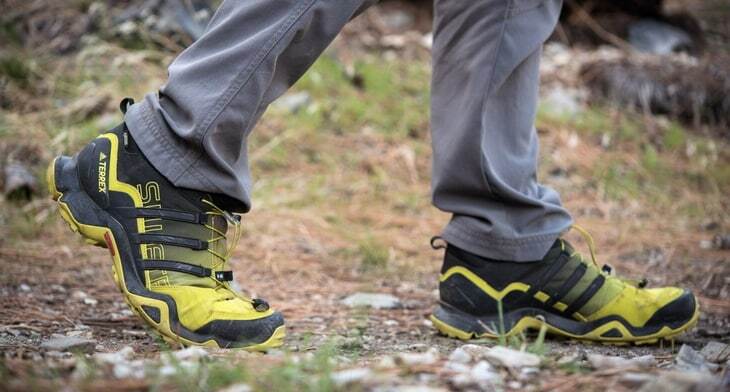 Their, Men’s Moab Ventilator Mid Hiking shoe, has many of the listed attributes above and gives extra support at the ankles, which is great for long hikes. This brand is known for making great hiking shoes that are dense in the sole and waterproof. Their, Women’s Targhee II Waterproof hiking shoes, are comfortable and supportive, and made for short or long hikes. This shoe has many lugs for stability and traction, as well as styles! The prices for KEEN’s boots are mid level, but not very cheap. KEEN makes shoes that are perfectly matched with whatever outdoor activity you are engaging in! 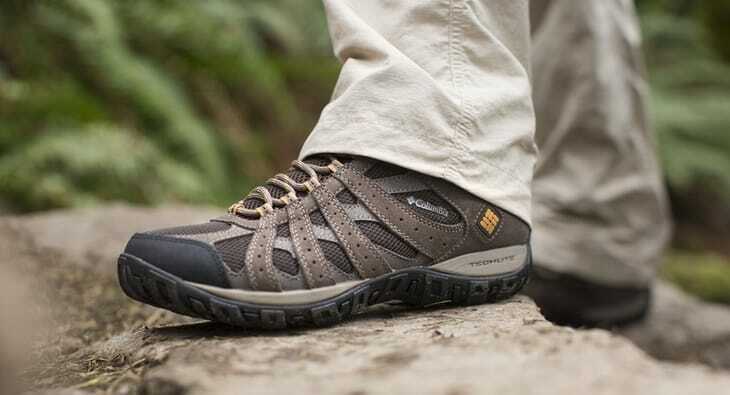 Hi-Tec is known for making hiking shoes that are not only waterproof but have the ability to breathe well from their mesh material and they make some really stylish looking products! For example, the Hi-Tech Men’s Bandera Mid WP Hiking shoe is not only good looking, but includes padded insoles, is waterproof, and highly durable. The mesh material is made of nylon and gives the much needed air circulation within the shoe, no matter the weather. 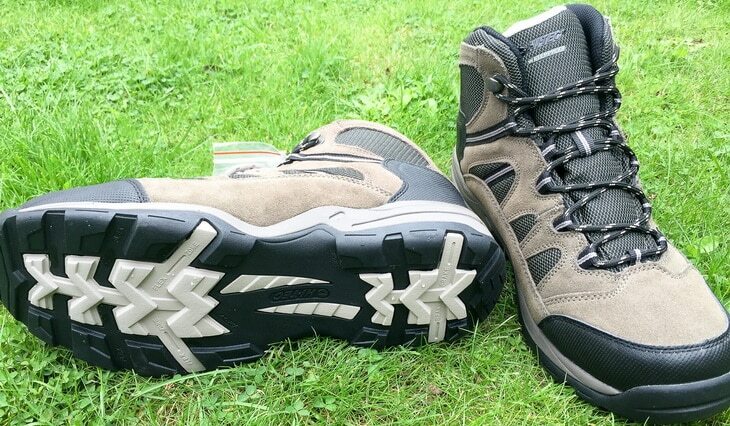 Another great thing is that Hi-Tec makes very affordable shoes, and you will have no qualms with their prices! 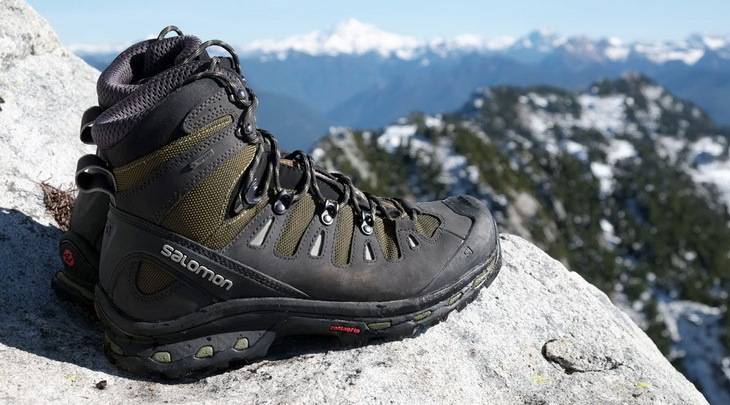 Salomon makes hiking shoes that are made from waterproof leather materials and are light in weight, plus highly flexible. The 3D chassis is comfortable and supports your feet without a problem, plus it is stable and lets you flex your feet. The lining is made of Gore Tex material that is waterproof. Salomon really does make great products and they are quite innovative when it comes to creating new gear for your feet to enjoy outdoors. Their prices can be a little steep, costing hundreds of dollars, but if you are looking for something stylish, unique, and long lasting, then a Salomon shoe might be great for your feet! 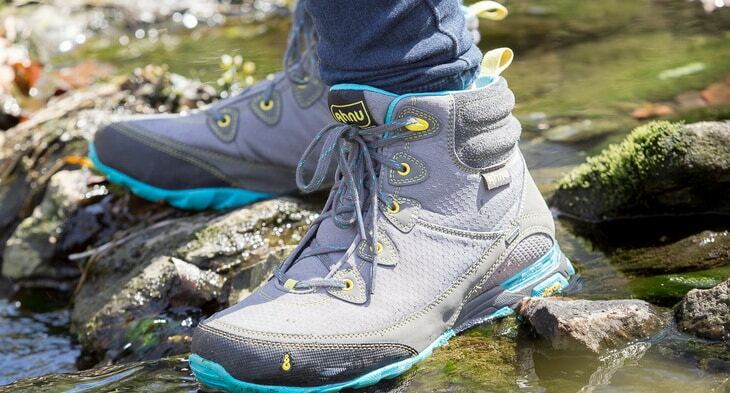 Lowa is known for their hiking apparel, especially their hiking shoes. The only downside is that some of their hiking shoes can be pricey, going into the hundreds of dollars. But maybe you will change your mind when you see the Lowa Men’s Renegade GTX Hiking shoe. It is made for hiking, but can also be great for backpacking and other outdoor fun. The mid sole technology that is used cuts down on the weight of the shoe. Also, it is very durable, stable, and provides extra cushion in the sole. The outsole is made tough to take on harsh terrain and rough activity. Another great thing is that Lowa makes some of their hiking shoes with such technology that there is less weight on your toes! What Do Other Hikers Say? Overall, hikers love these brands and have used them for their hiking needs for long periods of time. Users love that they can find a hiking shoe that fits their needs from any of the above brands. Overall, they were looking at price, comfort, soles, and other materials that make up the shoes. Hikers are definitely pleased at all of the great choices they have to choose from. Some hikers say that certain shoes do not last as long as others, and this may be from the stitching or other materials in which they are made. This is why you should make sure you are getting a quality product. Below are some of the pros and cons about these brands, in general. You will have to make up your own mind on what will work for you, as not all user experiences are the same. These brands offer many positives about their hiking shoes. They generally have great mid soles, outsoles, and are compatible with crampons. These brands offer a variety of hiking shoes that will fit your needs, specifically. You can also find hiking shoes with crampon compatibility, as well as a hiking shoe that can fit your budget! Keep an eye out for quality materials, as this allows your shoes to live a long life. Many users say these brands are great, but some of their hiking shoes do not breathe well, or they are made of materials that are not high quality, so the shoes might wear quickly, or the stitching may start falling out. Some users say hiking shoes are expensive, as well. This is why it is important to do research before you buy a new pair because some hiking apparel can cost in the hundreds of dollars. Be sure that the shoes are made of good materials, because a good pair of boots is going to cost a little more, in many cases. 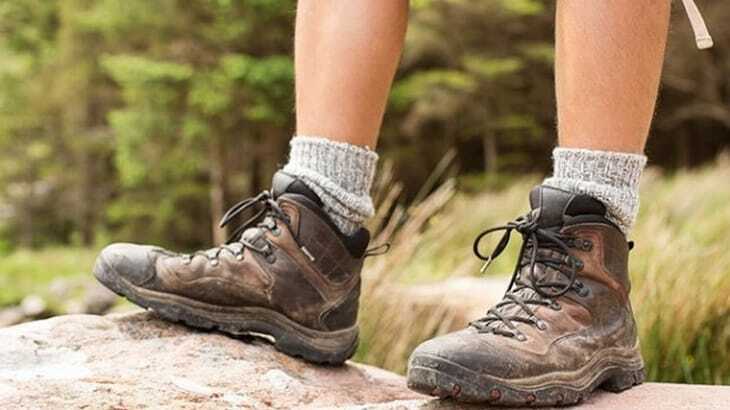 Hiking shoes are definitely an important part of hiking, because without them, your feet will not be comfortable, and will ache by the end of your hike. Nobody wants blisters or sore feet after a long day! Now that you know the important components, and some of the top brands out there, you can find some hiking shoes that will fit your needs! Why not take a look at our reviews of the top minimalist hiking shoes in order to make trekking safer and fun? It’s a great resource piece to read. What type of hiking shoes do you own? What makes them so great? We want to hear from our readers! Please leave a comment below and share your thoughts on hiking shoes! As always, thanks for reading!